The Augusta, GA Great Strides walk is a wrap for 2016! If you know me, I can make everything into a competition...so I was thrilled when we were the top fundraising team!! We raised $13,325 as of today!! Wow - that is a huge number...our biggest yet! The Augusta events are projecting to raise over $63,000! 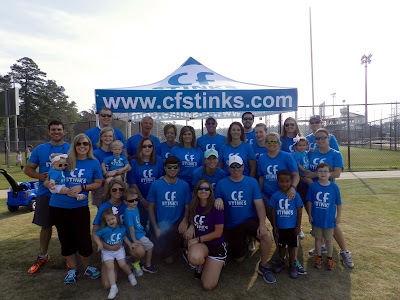 These wonderful folks are who run the CF studies I participate in! Will & I with our team banner! My beautiful sorority sisters that came out to walk (minus 1). It was a gorgeous morning!! My team was asked to lead off the walk as the top fundraisers - pretty cool!! I love looking at the pictures and seeing how my team has changed throughout the years. I have my faithful bunch that never miss! The biggest change being all the kiddos! I love that they join in...even though they don't understand what's going on, they happily join in! We concluded the hot day with a fiesta back at my house...complete with food, cocktails, corn hole and lots of laughs. So, thank you sooooo much to my family and friends that came out on Saturday. Your presence there means more to me than any monetary donation ever could!